Sizing: 25x8R-12, 25x10R-12, 26x9R-12, 26x11R-12, 27x9R-12, 27x11R-12, 27x9R-14, 27x11R-14. 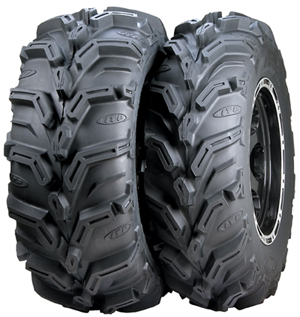 The industry's first Extreme Terrain RADIAL tire! Radial construction means the Mud Lite XTR rides smooth and finds more traction than a bias-ply tire because of a larger contact patch. A radial tire's footprint actually grows under load! 14-inch UTV 1000-pound maximum load capacity per tire. Super-aggressive tread design features 1 1/8-in. deep, angled, grooved lugs to achieve an exceptional level of traction. Two diameters provide you with the ability to tailor a tire choice to your specific riding requirements. The 12-inch option is ideal for primarily muddy conditions, offering better flex and more flotation. The revolutionary 14-inch model is an excellent all-around trail/mud choice, with its lower-profile sidewall resulting in reduced flex and a dramatic improvement in handling and rider confidence.